Emotional distress is common during chemotherapy, and supportive interventions during this time are often required. Mindfulness-based interventions appear promising amongst cancer survivors, but scant research has been conducted amongst patients undergoing acute treatment. This trial compared the efficacy of a brief mindfulness-based intervention (bMBT) with relaxation therapy on reducing distress amongst chemotherapy patients. Sixty-eight people receiving first-line chemotherapy at Auckland City Hospital were randomised to bMBT (n = 32) or relaxation training groups (n = 36). In both conditions, participants attended three 90-min weekly sessions. Overall distress (distress thermometer (DT); impact thermometer (IT)), cancer-related stress (Impact Events Scale–Cancer (IES-C)), cancer symptom distress (Memorial Symptom Assessment Scale–Short Form (MSAS-SF)) and social avoidance (SA) were assessed at enrolment, post-intervention and at 3-month follow-up. Both groups reported reductions in overall and cancer-related stress over time. Immediately post-intervention, however, bMBT (but not relaxation training) participants reported increased symptom distress, marginally increased social avoidance and decreased quality of life. So whilst overall distress and cancer distress declined in both groups, the mindfulness intervention was associated with increased symptom distress and social avoidance and reduced quality of life. 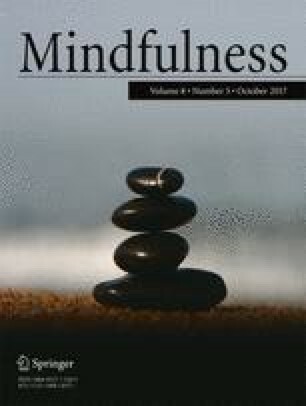 This report presents a randomised controlled trial of a mindfulness-based intervention during chemotherapy and suggests that care is needed in employing mindfulness-based interventions in acute health treatment contexts. This research could not have been conducted without funding from the Oakley Mental Health Foundation, the generosity of our participants and support of the Medical Oncology Department, Auckland City Hospital, the Regional Cancer and Blood Service, and the Auckland Division of the Cancer Society. We also thank Clinical Psychologist, Sue Dykes, for her mindfulness expertise and Natalie Tuck, Kate Loveys and Katie Simpson for their research assistance. LR designed and executed the study, delivered interventions, analysed the data and wrote the paper. IB collaborated with the study design, analyses and editing of manuscript. DB collaborated with the study design, recruitment of participants and editing of the manuscript. NC supervised the design and execution of the study, analyses of data and collaborated in writing paper. Clinical Trial Number: Australian New Zealand Clinical Trials Registry ACTRN12613000238774.